The crusaders rested here following the Banner of the Cross across Europe to the Holy Land. Kings, Queens and Princes have worshipped here on their way to and from the Continent. 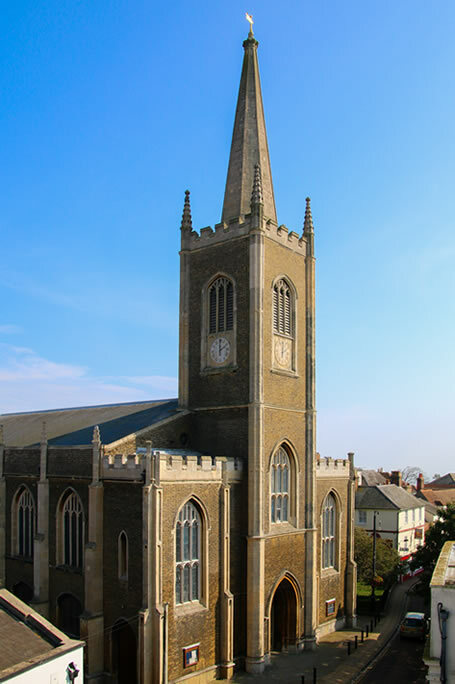 Samuel Pepys (twice MP for Harwich), Willoughby, Drake, Howard, Frobisher, Nelson and Daniel Defoe almost certainly attended this church whilst staying in Harwich. Boswell and Dr Johnson prayed to their creator here for protection for Boswell on his continental tour. Christopher Newport leader of the expedition which founded Jamestown in 1607 – The first permanent English settlement in America was baptized in the old church on 29th December 1561. Christopher Jones, Master of the Mayflower, was twice married in the old church, in 1593 and 1603. Both marriages were recorded in the church registers which date back to 1559 and also contain the baptism of some of his children. Also to be found here are the names of Richard Gardiner and John Alden (the hero of Longfellow’s poem “The Courtship of Miles Standish”), who were among the Pilgrim Fathers. The first chapel was almost certainly built of chunks of local septaria, examples of which can still be seen in some of the cellars in the town and in remnants of the old town wall between the churchyard and the Hanover Inn. The chapel was enlarged by Adam Bakyll, a rich Harwich clothier, who died in 1404. It was repaired and beautified by public subscription in 1775, but by 1819 was in such a dilapidated state as to be unsafe. It was therefore pulled down and the present graceful church erected on the same site, being consecrated by Dr Rowley, Bishop of London, on 20th July 1822. Built of London brick and Coade stone (the secret of which has been lost), it is in simple Gothic style and cost £20,000. It consists of a tower and spire with eight bells, a nave, aisles, galleries and chancel, and was designed to seat 1,500 people, the largest in the district. The slim graceful columns inside the church are not stone but iron, as are the window frames, a product of the industrial revolution which was getting underway. The architect was M G Thompson. The Nave Ceiling is said to be unique and is most attractive. A List of Vicars can be seen by the SW door with a picture of the old church. Ralph de Pelham, 1365, the first vicar of whom there is any record, was granted “Three Quarters of two Bushels of Corn, together with two Cartloads of Straw, of which one is for his Bed and the other for Strawing the said Chapel, to be received annually from our Rector of Dovercourt”.